Character development is an important part of writing or reading a novel. It may start as soon as the first page is turned, or it might not be shown until the end of the book. 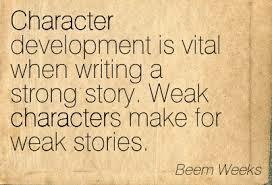 Either way, characters of a book, whether it be written or read, should always be developed further. Character development is creating a character’s background, personality, appearance, and further changing them as they go through hardships and tough trials. That is how character development is. We develop our characters by describing them. Appearance, personality, background, their past, and their physical and mental shape. All characters should developed in books. As we follow them throughout the book, characters will be revealed. It can be a slow process, finding out the character’s personality and describing their appearance, their attitude towards things that seem almost impossible, or hard. We cannot go through a book that does not have character development. Is it possible to read a book and not know anything about the character that we are reading about? No. We have to know what they look like, how they act, their internal and external motivations and conflicts. We need to know to them, personality-wise. It would be no fun to read through and entire book and in the end, not understand the character, or characters, at all! Background is also important. All characters have a past, ones that they will either be ashamed of and hide away, or ones that they are happy to have. If characters have constant struggles with their past, we, the readers, should understand sooner of later what those struggles are. What caused the character to be ashamed of their past? What made them the way they are now? It can be a slow process, tiny clips of their past being revealed, one day becoming a puzzle solved. After all, characters should be puzzled if there are characters that have inner-conflict with themselves because of their past. It should develop further. . .
And wouldn’t we like to know if the character has red or brown hair? Hazel or blue eyes? Maybe a mix of both? Characters’ appearances should further develop until they are described. Hair color, eye color, skin color. These are all important developments so that we can have a mental picture of what the character look likes. Otherwise we just go through the entire book not really finding out what the character looks like. One tiny detail can paint an entire picture for us about the characters. Character development is a long process. Usually, if it is in a series, we learn something new about the character(s), whatever it be. Characters can be developed by an explanation, an action, or something that makes them do something, which will make them grow to become a more realistic person. The characters we read about or write about should expand as we dive deeper into the printed pages. Character development is an essential of writing a novel.